Stephany Ortega, right, received both the Alpine Bank Hispanic Scholarship and the Fast Forward Scholarship at Yampah Mountain High School's commencement ceremony at the Glenwood Springs Community Center on Friday. Stephany Ortega, winner of two scholarships, addresses classmates and audience members at the Yampah Mountain High School commencement ceremony at the Glenwood Springs Community Center on Friday. Yampah Mountain High School's executive director Troy Lange gives welcoming remarks at the graduating class of 2015's commencement ceremony in the ice rink at the Glenwood Springs Community Center on Friday. 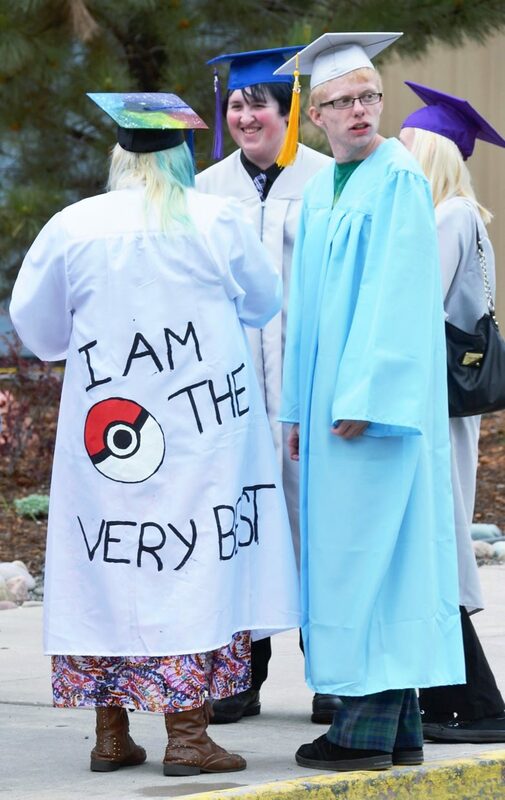 Yampah Mountain High School graduate Jennie Horst's graduation gown was a great example of the student body's dedication to individuality. Students in the Teen Parent Program held onto their children during the Yampah Mountain High School commencement ceremony on Friday. 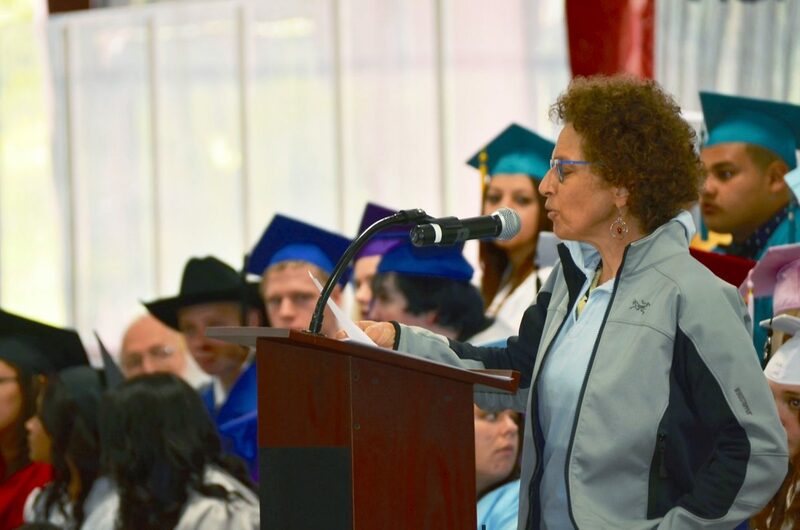 Susy Ellison gave the keynote speech at Yampah Mountain High School's commencement ceremony at the Glenwood Springs Community Center on Friday. The Yampah Mounatin High School Music Ensemble played during commencement at the Glenwood Springs Community Center on Friday. 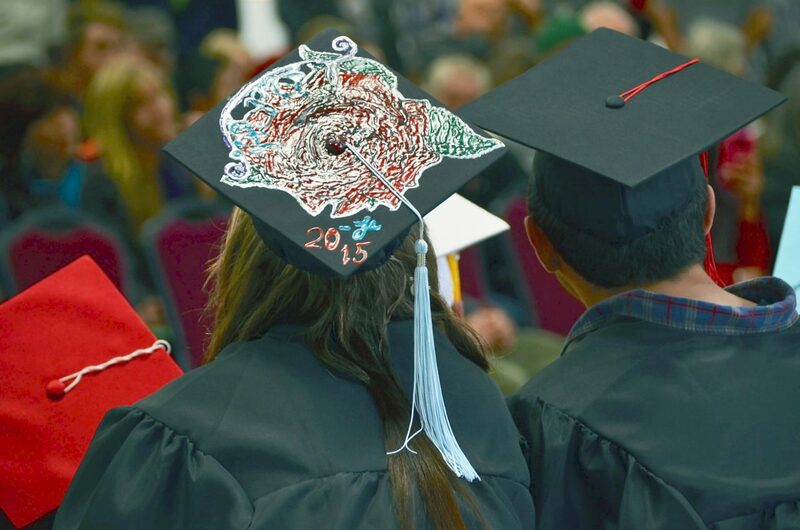 Many students decorated their mortarboards for graduation day at Yampah Mountain High School's commencement ceremony at the Glenwood Springs Community Center on Friday. 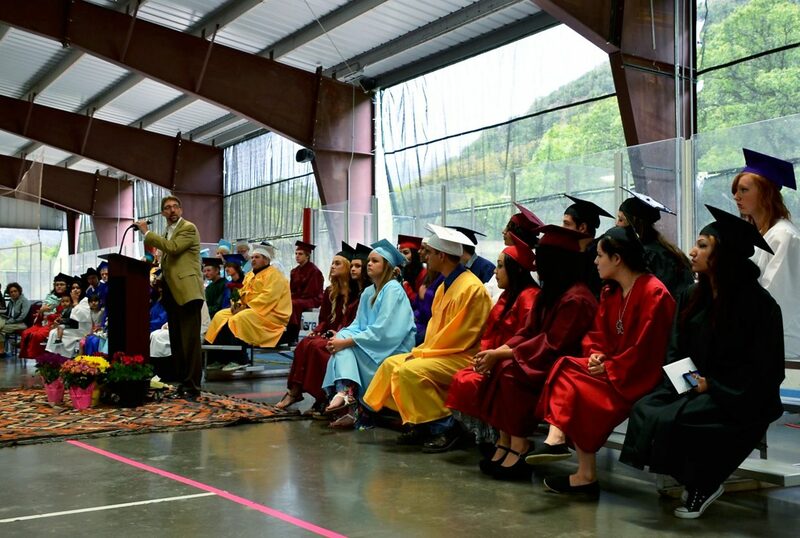 Individuality, hard work and believing in oneself aren’t words that get lost on the graduates of Yampah Mountain High School. 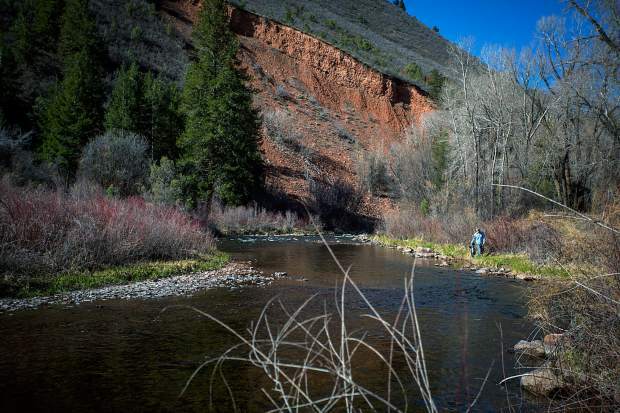 In fact, they are the very definition of the alternative public high school in Glenwood Springs that serves students from four area school districts stretching from Parachute to Aspen. Take 2015 graduate Stephany Ortega, for instance. 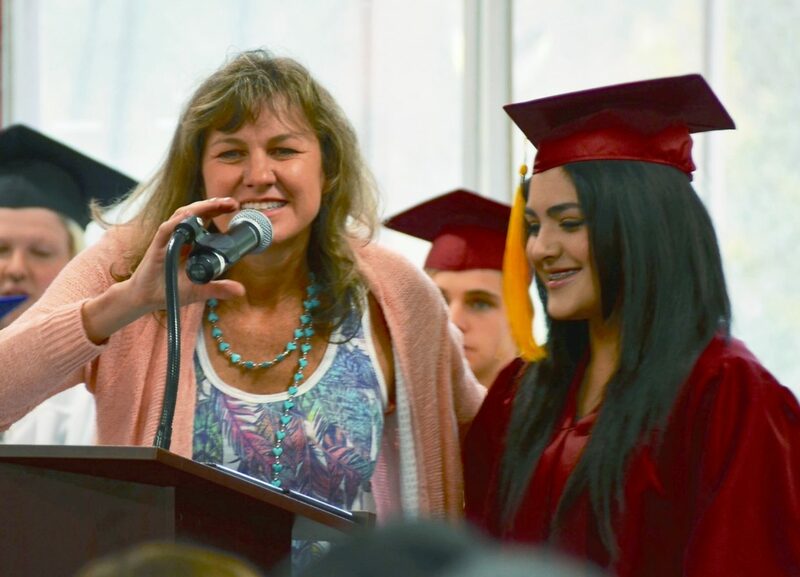 After dropping out of traditional high schools three times, Ortega came to Yampah two years ago determined not to give up, Principal Leigh McGown shared during the school’s graduation ceremonies at the Glenwood Springs Community Center arena Friday morning. Ortega continued her education while working two jobs to help with family expenses, and even began taking college-level classes at Colorado Mountain College. She recently earned an A in her college algebra class. On Friday, Ortega was presented with the Alpine Bank Hispanic Scholarship and the Two Rivers Community Foundation’s Fast Forward Scholarship to help her pursue a nursing degree at CMC. 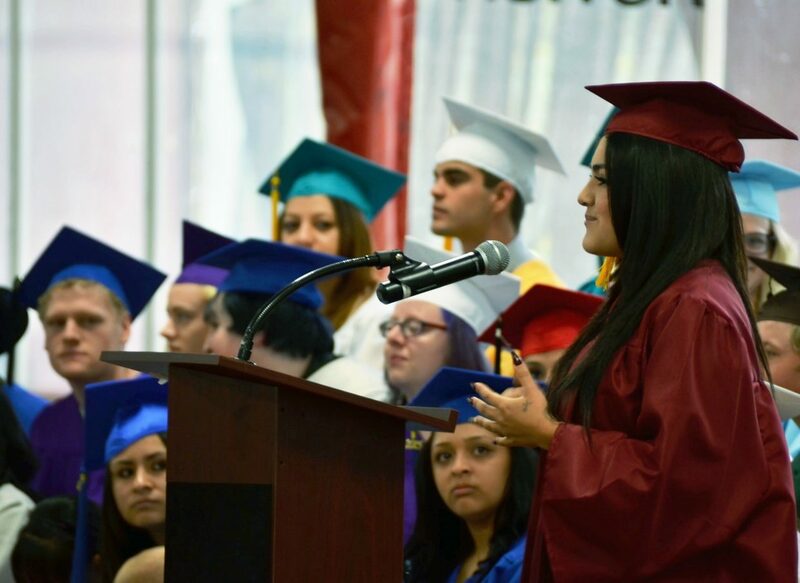 “I’m so proud because I’m going to be the first one in my family to graduate and go to college,” Ortega shared with her classmates during the time Yampah traditionally sets aside for any of the graduates to come to the podium and say a few words. 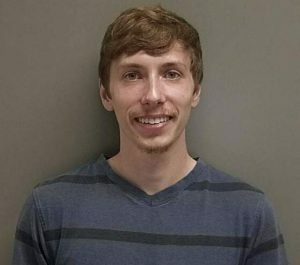 “I would like to thank all the teachers for being there to support me … You’ve made me very happy,” Ortega said. 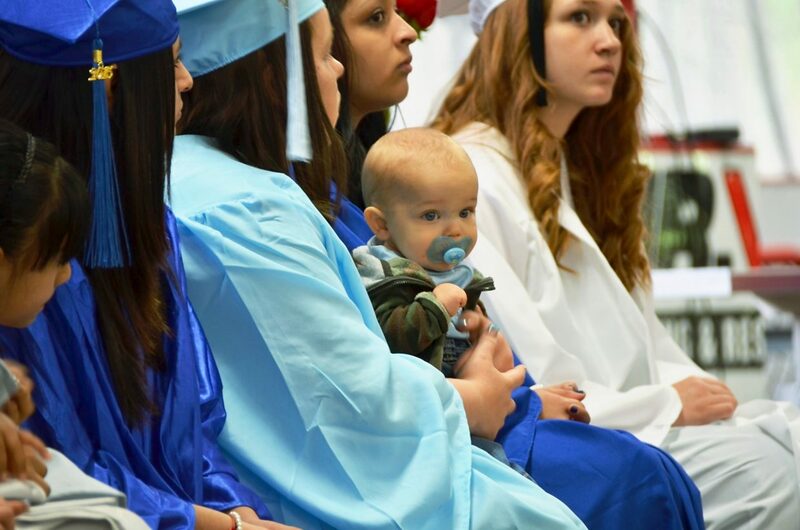 Yampah High’s 52 graduates, including eight mothers in the school’s Teen Parent Program, ushered in high school graduation season in Garfield County. 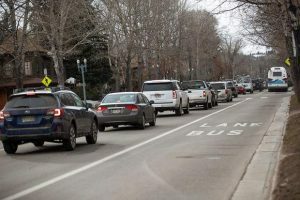 Coal Ridge, Rifle and Grand Valley high school graduation ceremonies take place today, and Roaring Fork School District commencements are set for May 29 and 30. 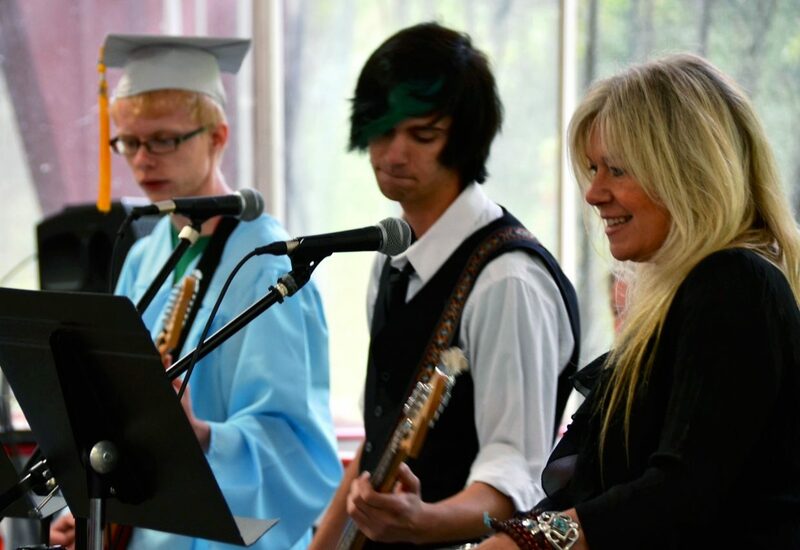 Former Yampah Mountain science teacher Susy Ellison gave the commencement address Friday. She admitted that she didn’t remember too many “factoids” from her own high schools days. What she did learn ran the gamut from the “truly useful” to the “merely interesting” to “why bother?” Ellison shared with her former students. Personally, Ellison went on to have a successful teaching career including 17 years at Yampah, won multiple science teaching and environmental education awards, and had the opportunity to participate in several science research expeditions that took her to both polar regions of the earth. 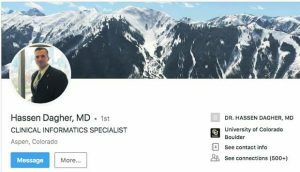 Last year, she put in 700 miles hiking the Rocky Mountain Trail, which gave her a lot of time to reflect on all she has learned, experienced and taught to others. But when it came to giving advice to this year’s graduates, she turned to the many Yampah alumni that she has kept up with over the years, posing the questions: What did you learn at Yampah? And, what have you learned since?